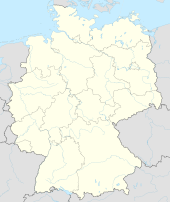 Braunschweig (German pronunciation: [ˈbʁaʊnʃvaɪk]; Low German: Brunswiek [ˈbrɔˑnsviːk]; Inglis: Brunswick), is a ceety o 247,400 fowk, locatit in the federal-state o Lawer Saxony, Germany. It is locatit north o the Harz muntains at the farthest navigable point o the Oker river, whilk connects tae the North Sea throuch the rivers Aller an Weser. The offices o the German Federal Bureau of Aircraft Accidents Investigation (BFU) are locatit in Braunschweig. ↑ "Bevölkerungsfortschreibung" (in German). Landesbetrieb für Statistik und Kommunikationstechnologie Niedersachsen. December 31, 2009. Accessed March 21, 2011. ↑ ""Braunschweig und seine Freunde in der Welt"". Braunschweig.de. Retrieved April 7, 2011. This page wis last eeditit on 15 Februar 2017, at 19:42.